A three bedroom semi detached family home situated on a nice quiet Cul d sac close to all local amenities. 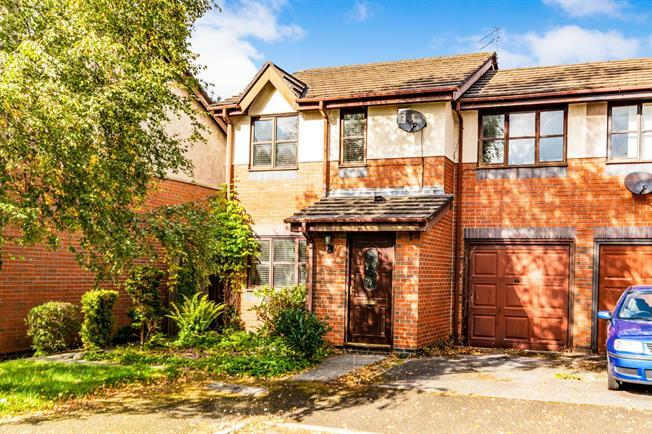 The property offers a nice entrance hallway, good size lounge, fully fitted kitchen diner, utility room integral garage to the ground floor and three double bedrooms, storage and a family bathroom to the first floor. The property come fully double glazed and has a nice enclosed garden to the rear with off road parking for several cars. Viewings on this property are highly recommended. Solid oak flooring, ceiling light. Double glazed wood window facing the front overlooking the garden. Radiator, solid oak flooring, original coving, ceiling light. UPVC patio double glazed door, opening onto the patio. Double glazed wood window facing the rear overlooking the garden. Radiator, tiled flooring, part tiled walls and tiled splashbacks, downlights. Granite effect work surface, wall and base units, one and a half bowl sink with drainer, integrated oven, integrated hob, stainless steel extractor, space for dishwasher, space for. Double glazed wood window facing the rear overlooking the garden. Heated towel rail, tiled flooring, shelving, downlights. Space for. Double bedroom; double glazed wood window facing the front overlooking the garden. Radiator, carpeted flooring, built-in storage cupboard, ceiling light. Double bedroom; double glazed wood window facing the rear overlooking the garden. Radiator, carpeted flooring, ceiling light. Double bedroom; double glazed wood window facing the front and rear overlooking the garden. Radiator, carpeted flooring, ceiling light. Double glazed wood window with frosted glass facing the rear. Heated towel rail, tiled flooring, tiled walls, downlights. Low level WC, panelled bath with mixer tap, shower over bath, pedestal sink and vanity unit with mixer tap, extractor fan.